Trinity Episcopal Church, Russellville, is one of the oldest churches in the Diocese of Kentucky. 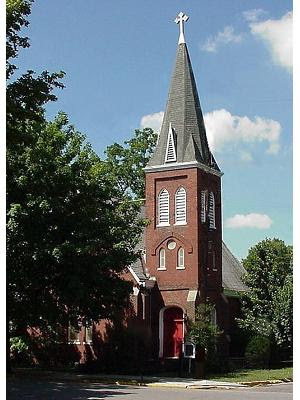 Since its organization in 1836, Trinity Church has served as an Episcopal presence for the counties of Logan and Todd in south central Kentucky. Due largely to the dedication and devotion of its membership and support from the Diocese of Kentucky, Trinity Church has ministered in these counties for one hundred and seventy-five years. Trinity is a small congregation in a small community reaching out to make a difference in the world. The Episcopal Church has a unique understanding of grace and forgiveness through God’s love. We know there are God-seeking people in our community, and we know we have something of deep value to offer them. Trinity Church offers in a very special way the opportunity for people to experience a sacred-safe space; to grow in appreciation of Christ’s presence in one another and all creation; and to travel the spiritual journey with an open mind and heart. We seek to share this vision and experience with people who are hungry for a relationship with God. The congregation of Trinity Church invites you to visit our historic church and to join us for worship. We gather each Sunday as Christians to hear the Good News, to sing God’s praises, to say the prayers, break the bread and share the cup. We find our mission in the power of the Holy Spirit and the directives of the Baptismal Covenant: “To proclaim by word and example the good news of God in Christ; to seek and serve Christ in all persons, loving our neighbors as ourselves; to strive for justice and peace among all people and respect the dignity of every human being.” We are an open and accepting community, inclusive and diverse. We welcome you to join us from whatever tradition you come. As a mission congregation, Trinity Church is governed by a Bishop’s Committee under the guidance of the Bishop of Kentucky, the Rt. Rev. Terry Allen White. Use the menu on the upper left to navigate our site. Please Contact Us if you have any questions about our church!